The classic green Ford Mustang GT that served as the “hero car” in the 1968 Steve McQueen film Bullitt is heading to Washington, D.C., where it will go on display in celebration of the 54th anniversary of the Blue Oval’s iconic pony car. The car was feared lost until very recently, having fallen off the map decades ago while in the possession of the Kiernan family in New Jersey. After the car’s current owner, Sean Kiernan, revealed to Ford that he was in possession of the Hollywood relic, the car received a mechanical restoration and went on display at the 2018 Detroit Auto Show earlier this year. The film Bullitt contains one of the most iconic, universally lauded chase scenes in cinematic history, in which Steve McQueen’s character, Lt. Frank Bullitt, chases down a couple of baddies in a Dodge Charger driving his Highland Green Ford Mustang GT. The scene plays out on the hilly streets of San Francisco, lending the chase a unique rhythm with lots of jumps and hard landings as the two cars ascend and descend at a blistering pace. Now, the “hero car” from that scene – one of two identical examples used in filming, which was kept away from any damaging stunts so that it could be kept presentable for slower shots – is going to the National Mall in the US capital. 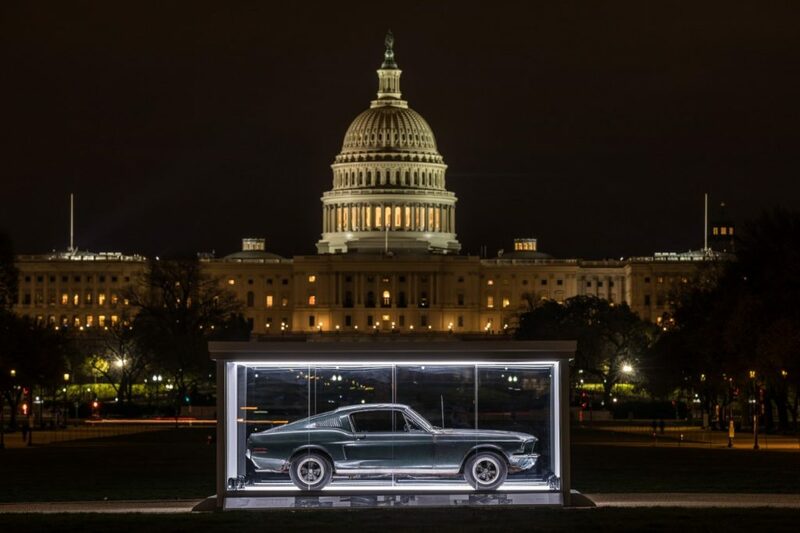 From now until April 23rd, the celebrity Ford Mustang GT will be on display in an illuminated glass case as part of the Historic Vehicle Association’s “Cars at the Capital” celebration. Alongside it will be Ford’s 15-millionth Model T.
“To see the Bullitt under glass within steps of the Smithsonian museums, the Lincoln Memorial and the Washington Monument is a fitting tribute to automobiles that have transcended utility to become truly iconic examples of America’s culture,” says Ford Mustang Chief Engineer Carl Widmann.